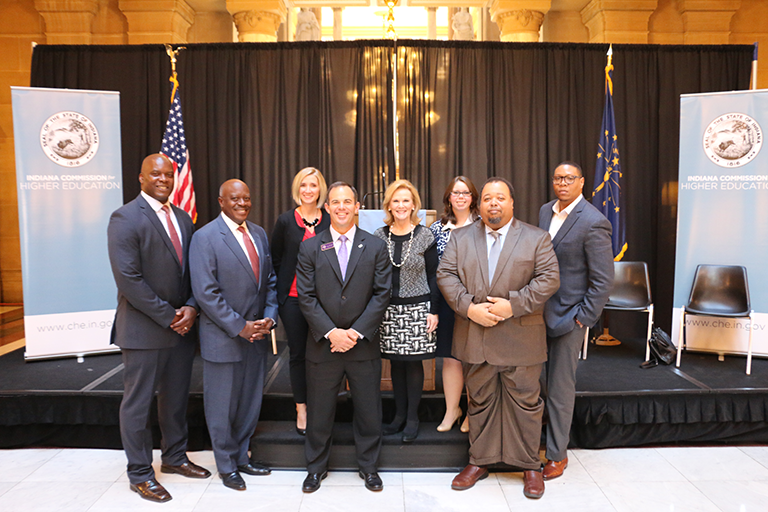 Leaders from Indiana Black Expo, Indiana University and the Indiana Commission for Higher Education gathered today at the State Capitol to announce a new partnership to help hundreds of Marion County’s low-income and underrepresented students. The program, called the Drive for Affordable College, identifies and helps low-income students enroll in Indiana’s 21st Century Scholars Program and visit a college campus—a step Scholars must complete in high school to prepare for college and earn their full-tuition scholarship. Created in 1990, the 21st Century Scholars program provides up to four years of full tuition scholarships for low-income students who meet academic and behavioral requirements. During high school, Scholars must also complete a series of activities designed to prepare them for college success—such as completing a high school graduation plan, filing for financial aid, and visiting a college campus. During the 2016-2017 school year, the Marion County Drive for Affordable College partnership will work to enroll 500 new students in the 21st Century Scholarship program and expose 200 current 21st Century Scholars to the Indiana University Bloomington campus. As part of the partnership, Indiana Black Expo will select students who qualify for the 21st Century Scholars program from Indianapolis Public Schools, Warren Township, Wayne Township and Archdiocese of Indianapolis Catholic schools. Two units in IU’s Office of the Vice President for Diversity, Equity and Multicultural Affairs will be actively engaged with this partnership—IU Bloomington’s 21st Century Scholars Program and IU’s Community & School Partnerships unit. These teams will work closely with the Indianapolis Chapter of Indiana Black Expo and participating school districts. The partnership will provide food and transportation for Scholars to the IU Bloomington campus, where students will be introduced to academic life, participate in a college fair and tour the campus. Learn more about Indiana’s 21st Century Scholars program at Scholars.IN.Gov. The high school graduating Class of 2017 will be the first group of Scholars required to complete the activities outlined in the Scholar Success Program. Through community partnerships like Marion County’s Drive for Affordable College program, Indiana is working to ensure all Scholars complete these activities that prepare them for college success. Since May 2016, the number of Class of 2017 Scholars on track to earn their 21st Century Scholarship has increased by 30 percent.